Automotive Gesture Recognition Market size was valued at over USD 1.0 billion in 2017 and is estimated to exhibit around 42% CAGR from 2018 to 2024. Development in IoT enabled vehicle management system, in-car entertainment and automation will propel automotive gesture recognition market growth over forecast period. Advanced camera, RADAR and LiDAR sensor technologies can monitor the vehicle surrounding and enable vehicle’s quick and safe response. Proliferating deployment of electronics for operating major vehicle functions including infotainment system, doors & windows movement, and HVAC applicationsuu are among the major factors escalating industry size. The growth of individual vehicle safety and intelligence is assisted by smart interaction with other vehicles and real time data servers. These vehicle management development boost fuel efficient driving and improved driver awareness. Superior vehicle management system reduces the overall utilization cost and boost the car entertainment applications thereby supporting automotive gesture recognition market growth. Increasing trend towards improved vehicular communications for providing enhanced information to drivers about the potential collisions along with proliferation of smart cars are driving product demand. The advanced vehicular communications including Vehicle to Vehicle, Vehicle to Infrastructure, Vehicle to Cloud, Vehicle to Pedestrian, and Vehicle to Everything provides a platform for advanced vehicle communication further supporting the automotive gesture recognition market expansion till 2024. Advancements in the system ensuring quick functioning, lag minimization and reducing touch latency contributes significantly towards reducing driver distraction and supporting the industry proliferation. System responsiveness delivering quick warnings along with implementing fast actions in real time are positively influencing the product demand. Superior probability and lower error rate with the implementation of gesture recognition will further enhance the industry size. Touch-based automotive gesture recognition market share will witness around 43% CAGR over the forecast period. Touch-screen technology is an electronic graphic display capable of sensing and tracing touch over its display area. The display driver, touch, and force sensing and fingerprint recognition technologies give drivers an array of safety features and user-interface capabilities. However, utilization of touch-based technologies in automotive industry causes distraction for drivers leading to increased risk of accidents, is anticipated to hamper the market growth. Touchless based system holds significant share as the system reduces time spent on scrolling through the menus and improve alertness towards vehicle maneuvering. The technology utilizes touchless sensors that track the user’s body motions and gestures for an input command to perform specific operations. This attribute plays significant role in contributing towards the touchless system market segment growth. 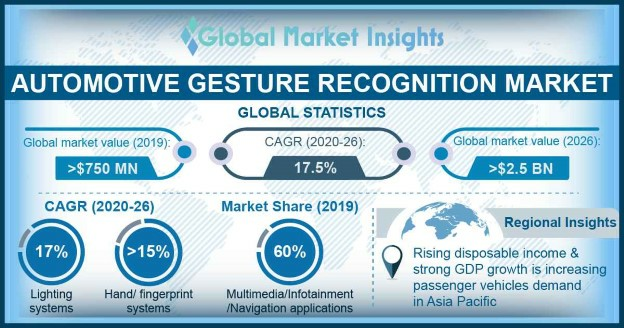 Hand/fingerprint automotive gesture recognition market size is expected to register over USD 8.60 billion by 2024 owing to multiple factors including increased safety regulations coupled with innovative technological advancements prompting the segment growth. Gesture recognition feature in automobiles also works on basis of facial recognition, lip movement, eye tracking and voice recognition. Industry participants are working towards decreasing the installation cost to enhance the adaptability of these systems across all automotive segments. Facial gesture recognition is gaining traction in automotive gesture recognition market owing to the creation of an effective non-contact interface between driver and the recognition system. For instance, In June 2014, Ford shifted towards facial gesture recognition for its next generation automobiles in partnership with Intel. By utilizing facial recognition software, cameras, and data analytics the company focuses to develop more personalized interaction between vehicle and driver. 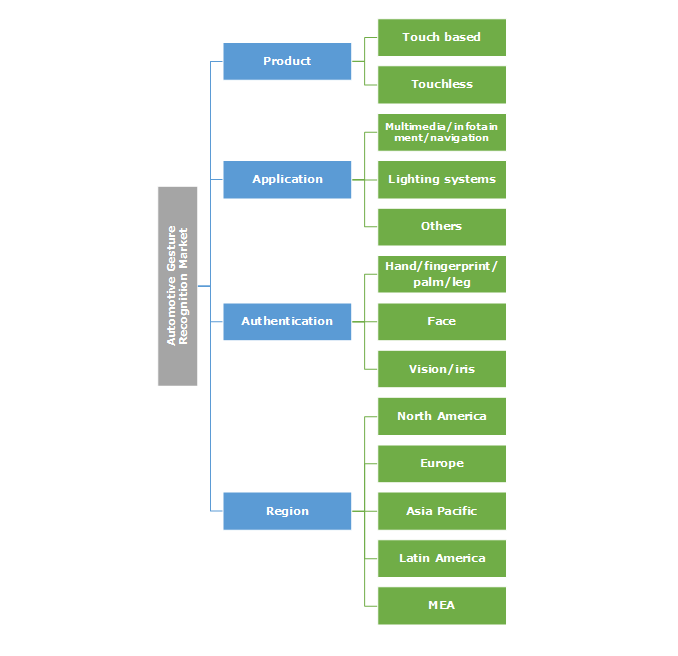 Sunroof automotive gesture recognition market will witness over 41% CAGR owing to increasing style appeal coupled with the availability of a multiple range including moonroofs, panoramic roofs, spoiler roofs, folding roofs, and pop-up roofs is supporting the segment growth till 2024. For instance, Volkswagen offers its cars with an innovative sunroof solution that opens with a wave of a hand. Land Rover offers an alternative way of closing a passenger car’s sunroof by moving hand beneath a sensor in the desired direction. The automotive gesture recognition systems provide focused and hassle-free driving experience as the driver monitors the road and the door/window operations simultaneously. The system continuously monitors the driver’s movements and with some easier and simple gestures, the doors and windows are operated easily, improving the driving experience and supporting the segment growth till 2024. Light commercial vehicles automotive gesture recognition market size will pose significant gains owing to increasing usage of these vehicles for transporting goods and passengers. Ease of connectivity with remote areas will further augment the light commercial vehicle sales over the forecast time frame. These vehicles are used in diverse applications including courier companies, vans, mini trucks, pickup trucks, etc. Widening usage of these vehicles will enhance the market revenue share by 2024. HCVs automotive gesture recognition market size will show considerable growth with increasing requirement for safety in these vehicles. These vehicles account for major road accidents on the highways owing to driver’s distraction. Stringent government rules and regulations associated with safety measures in several countries will increase installation of automotive gesture recognition units. Safety measures will primarily drive the segment growth during the study period. North America automotive gesture recognition market size will witness over 40% CAGR owing to increasing demand for gesture-based user interface in luxury cars. Shifting consumer preference towards advanced vehicle features and significant OEM investments in R&D will enhance product penetration. Technological advancement in automobile electronics and manufacturing process will reduce implementation cost over the study period. Europe dominates the automotive gesture recognition market share over the forecast timeframe. This can be attributed to presence of major automobile OEMs across the region. Industry participants are continuously engaged in R&D to develop new connected systems with touch-free gesture-based operation. For instance, in 2016, BMW announced to develop a gesture control-based UI called AirTouch that utilizes sensors embedded in the vehicle’s dash near the main infotainment display analysing 3D hand movements. This enables driver interaction with the infotainment system without touching the screen. Growth in sales of high-end luxury and sports cars will further amplify the industry size. Key automotive gesture recognition market participants include Delphi, Intel, Visteon Corporation, Sony Depthsensing Solutions, Harman International, EyeSight Technologies, Continental AG, and Apple. Industry players are expanding their product portfolio to enhance their consumer base. In September 2016, Continental launched a heads-up display for commercial vehicles to improve the safety of consumers and bring in the advanced technology in the market. Automotive gesture recognition systems are equipped in vehicles to operate multiple functions including navigation systems, windows & doors, music system, and others. Government regulations including the National Highway Traffic Safety Administration (NHTSA) under the U.S. Department of Transportation (U.S.DOT) includes the Federal Automated Vehicles Policy that provides policies for highly automated vehicles. These policies regulate the safety aspects associated with the gesture recognition-based systems, supporting the industry growth till 2024.